Yo, I'm Crateboy and I made a game called WizardWizard. 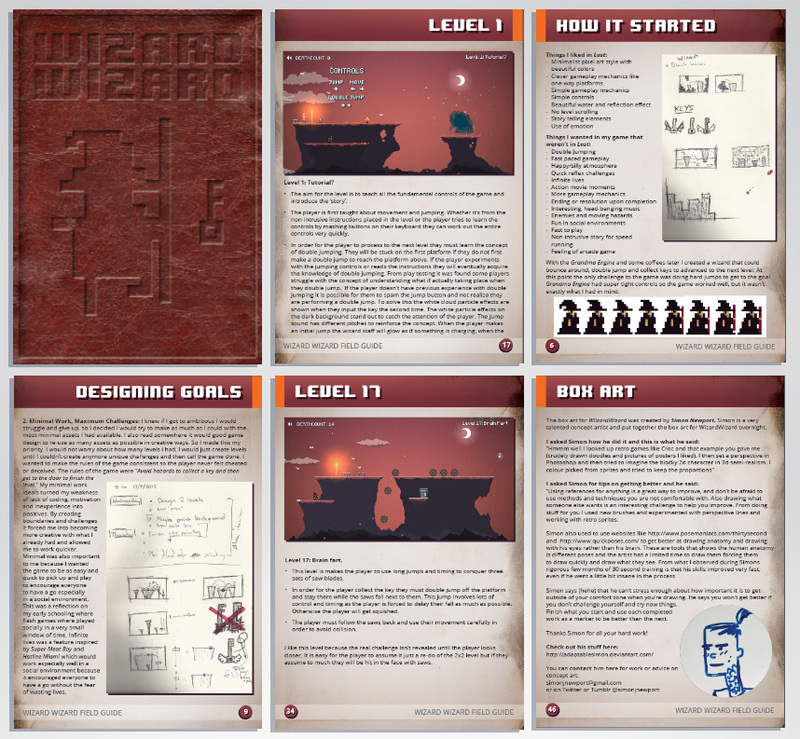 WizardWizard was in the GameMaker Humble Bundle recently and I made a whole PDF documenting WizardWizard and the design/level/art choices I made and why I made them. I'm so, so proud of the level design in WizardWizard, so I've included level break downs and notes to help you design great levels. The Bundle is over now, and I'd like to release the PDF for everyone else, or even bring attention to it for people who did buy the bundle. I made WizardWizard on $0 budget, in my spare time after school (and sometimes during school when I should have been studying) so it might be a good resource for new and young developers who want to create games and fast-track their process to! Also it includes stuff from my homies Simon Newport my concept artist and Travis William Clark (aka _TWC) my music guy! There's lots of stuff in there to enjoy and use. Lots of it has potential for cool projects other stuff were my first things I ever made, its really a mixed bag! I'm sure if you dig in there enough there's something for everyone whether its to use as is, remix, recolor, test, use as place holders or just generate ideas. Its all creative commons, you just have to use the stuff in good spirit, give credit where credit is due, don't pass it off as your own and don't sell it. You can use the stuff for commercial projects but consider donating or buy me a beer IDK. Have fun and let me know if you use anything! Edit: To be clear the .zip contains mostly art, 8 bit sounds and useful stuff like my pixel art tutorial and my favorite color pallets! This looks absolutely fantastic! How easy would say it is to implement considering I've had no d3d experience? This seems to be exactly what I'm looking for and assuming I can work it out I can see it getting a lot of use in my future projects. I use the Marketplace to sell and distribute assets that I did for practice, fun or were left overs in a project. I publish my assets on the marketplace to help find them a good home and I've accumulated a grand total of $6.90 after publishers cut. I love the marketplace because it is very easy to get my assets out there and there are a lot of takers especially with my free stuff. Publishing on the marketplace is a very time consuming process, making thumbnails, preview pictures ect. I like to make the presentation of my assets to be professional to not only support my self but also the website. As someone who isn't using the Marketplace with the priority of making cash the effort to reward ratio can seem very unbalanced at times. I'm sure if I wanted to make eventual cash I could make some art for a flappy bird clone, or an endless runner but I really enjoy trying to make niche assets for people to enjoy rather than keep up with the demand of the latest trend. I would like to redeem my $6.90 to buy myself a beer for my hard work but until I reach $100 after publishers cut I cannot. This isn't really a big deal for me and I understand why such limit is in place. That being said I would love to be able to put this money back into the community and purchase other peoples assets I've had my eye on. The possibility to be able to use the money raised before it enters paypal at its $100 claim point for use inside the website in a similar manner to Steam would be brilliant. If the busy YoYo team could make this happen, it would be fantastic and I think it would bring a lot more circulation of assets on the market as well as a much larger and needed diversity. #4688330 Retro Platformer Character and Graphics Pack! - Can't copy and paste in my login name and password. - Doesn't properly obey alt-tab order probably since its full screen / some custom window nonsense causing it to be ignored by alt tab. - My developer login doesn't work so now I have like 10 accounts across various YoYo things. you can't just go throwing stuff on that drive without consideration for the end user. Add the ability to put games on another drive. - The installer is weird. Besides that it seems passable. I'm a bit worried about it being another hasty "me too" item. We have Steam, Origin, UPlay, and people already complain about having to install something other than Steam. Seems like this will be super niche and no much more? Its super niche.... because its just for GameMaker! It serves its purpose and hopefully it will do well serving its purpose of being a medium to distribute GameMaker games. Also hit the brush button next to the "stop web server button" before you run it. #4611097 Nearly all the art you need for a platformer! All you need now is a player sprite! A monster escaping from a scary lab, anyone!? Clearly Nocturne is doing some sort of social experiment with all proceeds going to charity or something... right? RIGHT? Nocturne is the Andy Warhol of our generation. The arrows on the box really bother me as they're the only non-pixel item. The creases on the pants don't really suit imo. Everything else is pretty good! Simple because its more about the message and humor than gameplay. However it'd be awesome to have any button gain a skill that way I could type like an idiot. Maybe add max levels to your skills and replace them or add when you've reached the maximum that way you can fit in more jokes. More physical signs of leveling up would be awesome. Bags under eyes, tattered clothes, more sweat, more energy drinks until you're a zombie. A typing sound effect would be cool and monitor hum and light buzz would add to the atmosphere. Lighting effects would be great to add to the atmosphere to! #4576026 [Pixel Art] Character Sprites Made Easy! Can you (if you have some time) make the next one about more advanced animation? I like how you assume I can do advanced animation! hahaha. This tutorial series will be bringing things back to basics breaking things down for people who can't afford a graphics artists,, don't have time to become a good one but still want to be able to do justice for their games. Simple stuff. It depends on how much more advanced you want to get with animation. The next step up from this would be to fill in more frames of animation. Just add in more frames, use your imagination, more sword motion, legs crossing each other, arms swaying. If you really struggle with this I can put something together but if you just fill in the gaps you should be fine. For best inspiration look at how other pixel artists animate there stuff. An awesome example is Canabalt. Check it out when you have a chance, the animation is beautiful and its open-source so you can pick apart the animation frames. The character sprite has a ridiculous amount of animation. If you're lazy like me but you want stuff to look good look up rotoscoping. Its basically taking footage or frames and then drawing pixels over the top of it. It takes a bit of practice and you still have to have a knowedge of color and style but it looks awesome. People will think you're a massive cheater though... which they're probably right. The next tutorial will be on color, feel free to suggest what you want the 3rd to be. #4575317 [Pixel Art] Character Sprites Made Easy! Hahahahah wow that's awesome. That bobbing is hypnotic and hilarious, I dig it. Also I would recommend anyone starting out to get GraphicsGale. There is a fairly new version out which has some nice updates. It's free and it makes animations and spriting very intuitive and easy. #4575228 [Pixel Art] Character Sprites Made Easy!